Academia.edu, a social network for scholars, is unveiling a new feature today that its founder Richard Price hopes will help address part of the “credit gap” for research. 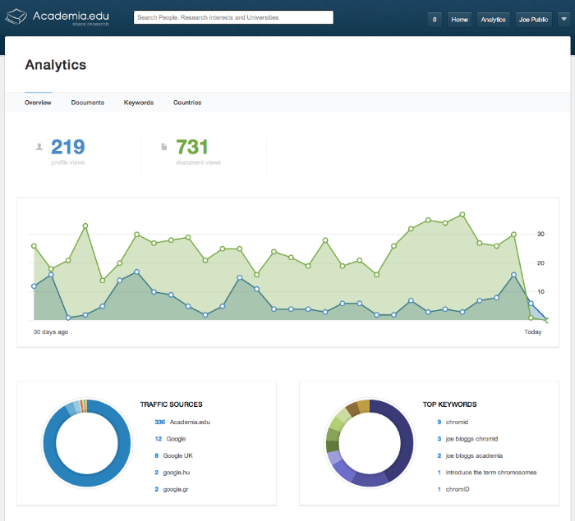 Academia.edu allows users to upload and share their research papers, and the site is launching its Analytics Dashboard for Scientists today that Price says will let scholars see the “real-time impact” of their work. Academic publishing has long been a black-box in terms of both who’s reading and who’s citing. Publishing in journals may be expected (required, even), but the delays in the publishing process can make it challenging to ascertain how much influence work has. “It typically takes about 3 to 5 years for citations to actually appear back in the process,” argues Price, pointing to the lengthy time between researching, writing, peer-reviewing, and publishing. That’s part of the problem with services like Google Scholar that do offer citation counts, Price contends. And certainly the new feature available on Academia.edu today is more akin to Google Analytics than Google Scholar. You can see the pageviews on your papers; you can see the keywords that led people to them; you can see where those viewers come from. The latter only gives details about the country of origin – enough for scholars to be able to tout the global reach of their work. It would be interesting to see more granular information – which city, which university even – but Price says there are certain privacy concerns before offering those sorts of details. Academia.edu isn’t the only site that offers these or similar services. The reference manager site Mendeley recently added a dashboard too. All this seems to reflect a number of changes in academic publishing that point to a more digital and more open-access future. It’s all in the service of accelerating scientific research, Price argues, by giving scholars immediate feedback (rather than waiting for that long publishing cycle). But as with any metrics offering, there’s a certain amount of ego-stroking here as well. Sure, you want “credit” for your work. You want to be able to track on research – yours and others’ – that’s new and/or widely-read and/or influential. But it also feels good to see the pageviews add up on your writing, and Price says that many of the scholars who beta-tested the feature found they were increasingly “addicted” to the stats. “There’s no going back now” to older, black-boxed forms of academic publishing, Price argues.